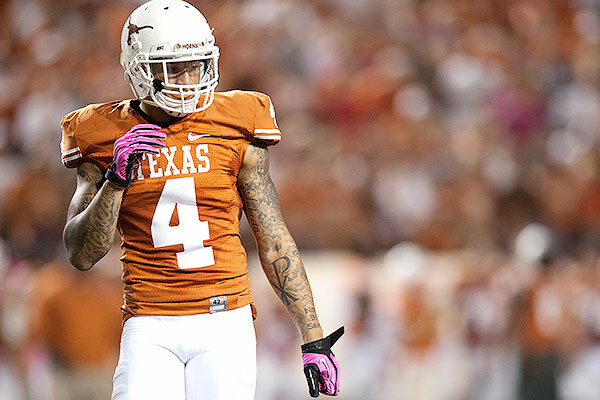 With the 15th overall pick in the 2013 NFL Draft, the Saints helped out their defense, as they took Texas FS Kenny Vaccaro. Vaccaro is a highly impressive athlete and is one of the most complete safety prospects to enter the NFL the past several years. His elite speed and explosiveness allows him to make plays all over the field vs. the run and pass, and his agility and smoothness allow him to play under control despite playing at such a high speed. His most impressive effort this season came against West Virginia, when he went man-to-man for much of the night vs. the explosive and elusive Tavon Austin and more than held his own. He is outstanding on run plays outside the box, as he takes excellent angles to the boundary and is able to stay square to his target and finish effectively in space. His ability to slide down and play nickel back only adds to his value at the next level, as coverage ability is paramount for safeties in today’s NFL which is so often based on spreading the field and exposing isolated match-ups. The New Orleans Saints didn’t emerge from the shadow of bounty-gate with a whole lot of things to brag about. The team started the season win-less, showed cracks all over the place and made it apparent that they needed to upgrade on defense in order to get better and return to the glory days of recent years. But while they needed some help, it was still unknown who exactly they’d end up going with. There was the possibility of going linebacker but drafting a safety was something the Saints could look at as well. The cornerback situation wasn’t the best in recent years either, even before the bounty-gate scandal rocked the bayou and before Sean Payton was suspended by the NFL. So it was clear that the Saints needed to fill holes but didn’t know who exactly to take. It was obvious that New Orleans needed to go defense, not only to fill holes but because of the division they play in. The Carolina Panthers may not be the best but they have explosive qualities to their offense, and the same goes for the Doug Martin helmed Buccaneers unit. Atlanta is and will be the offensive force in the NFC South until the Saints usurp them, so taking defense and boosting that unit was a need even if things had been in tip-top shape.